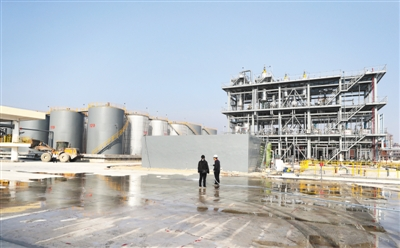 The first phase of a 100,000-ton high-end lubricant blending project began operations at Zhanjiang Hongda Petrochemical Co Ltd in the Lingang Industrial Park on Dec 28, offering an environmentally friendly solution to waste oil in the city. Covering 65 mu (4.3 hectares), the first phase entailed an investment of 190 million yuan ($29 million). It is expected to produce high-end lubricants by extracting and processing used mineral oil and oily waste from Zhanjiang and the surrounding areas. Once in use, it will process 25,000 tons of used mineral oil annually, which will result in revenue of 400 million yuan and tax payments of 35 million yuan each year. The numbers are expected to double when the second phase comes into operation. Listed among the top 50 enterprises in Zhanjiang, Hongda is mainly involved in sales of fuel oil, petroleum products, bitumen and sulphur. With products sold to Guangdong, Yunnan, Guizhou and other provinces, it reaps 1.2 billion yuan annually. In recent years, more and more waste oil has been discharged into the environment due to the booming manufacturing industry and a higher degree of mechanization. As an answer to environmental pollution, the oil recycling project can bring sound economic and social returns instead.